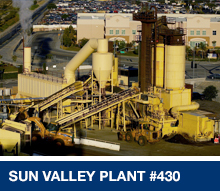 Blue Diamond Materials is a leader among hot mix asphalt suppliers providinghot mix asphalt materials for projects within the Los Angeles, Orange, Ventura, San Bernardino and Riverside County areas with emulsion and seal coat available at select plants. Blue Diamond Materials is part of Sully-Miller Companies consisting of Sully-Miller Contracting, United Rock and Blue Diamond Materials. 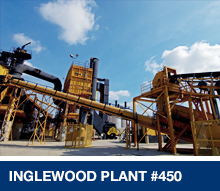 Whenever possible, Blue Diamond Materials, acts environmentally responsible by using Recycled Asphalt Pavement (RAP). With six plants at five different locations, all awarded the National Asphalt Pavement Association's Diamond Acheivement and Diamond Quality status, we consistently meet our customers' needs. 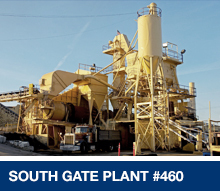 We have successfully produced a wide variety of asphalt mixes for various applications or specifications including greenbook (SSPWC), Los Angeles City mixes (Brown Book), Caltrans, FAA P401& P403, Asphalt Rubber Hot Mix (ARHM), Asphacolor, Glassphalt, in addition to specialty mixes as requested. Our Motto is "Safety First"
Blue Diamond Materials understands the critical impact safety has on our industry. The safety and health of our employees, the public, and the environment is on the forefront of everything we do. Safety is at the top of the list when it comes to Blue Diamond's core business values. Our employee-run safety department administers and oversees Blue Diamond's Incident Prevention Program by empowering every employee to take action. 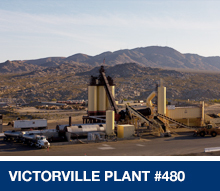 The team ensures our asphalt plants remain in compliance with company and agency standards on a daily basis. With our goal of continuous improvement, our dedicated employees, and our drive for excellence, we aim to reduce our incident rate every year. Our ultimate goal is always ZERO incidents. 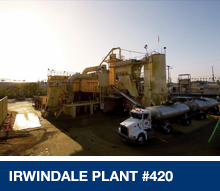 Our hot mix asphalt manufacturing facilities operate in Irwindale, South Gate, Inglewood, Sun Valley and Victorville. All of our plants have received the NAPA Diamond Achievement for Quality. We also have an extensive quality control and material design lab that is fully accredited by AASHTO and CalTrans Certified. Each plant has a technician and laboratory facilities to ensure that every ton of material produced meets the quality specification set forth by our customers. At Blue Diamond Materials, we are extremely conscious of our impact on the environment. We recycle thousands of tons of asphalt pavement each year saving valuable materials from landfills, and conserving virgin aggregates. This practice reuses the petroleum faction of our product by reusing the "glue" as new binder material from the originally product. This direct reuse reduces the demand for oil imports and produces a product equally to, and in some ways superior to 100% virgin asphalt pavement. We've also pioneered the uses of variable frequency drive motors on asphalt plants, which reduces our electrical demand and consumption. Blue Diamond Materials is leading the efforts to introduce EcoMat® Warm Mix Asphalt technology to the Los Angeles Basin and surrounding areas. 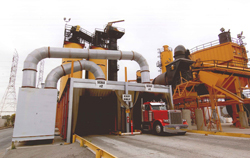 This process reduces the energy needed to heat asphalt mixes, reduces emissions at both the plant and the jobsite, and ultimately increases the performance of pavement. Blue Diamond Materials provides Hot and Warm Mix Asphalt materials and specialty mixes for use on runways, seaports, parking lots and public highways - meeting or surpassing the standards of Caltrans, Greenbook, City of Los Angeles Brownbook and the FAA. Super Cold Mix "Temporary Asphalt"
Blue Diamond Asphalt © 2016. All Rights Reserved. An Enthusiast Website Solution.